UPDATE: Due to a recent fire (21/11/18) on a neighbouring property, some of the land on which Sea Stone is situated has been affected. Prices have been reduced as a result. Please ask any questions prior to booking. Relax and enjoy the peace and tranquil beauty that surrounds this charming, limestone home. Sea Stone is a beautiful stone cottage with luxurious furnishings and cosy atmosphere in Emu Bay. Each stone was hand picked from the area and hand laid. Exposed interior structure consists of two jarrah jetty pileons from the old Cygnet River Bridge. 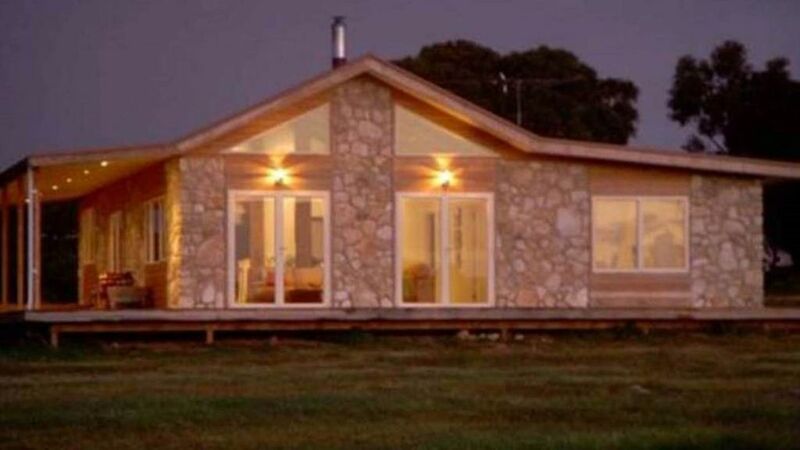 This house truly captures the natural beauty of Kangaroo Island. Take pleasure in the white sands and crystal waters of Emu Bay (2 minute drive) or unwind and observe the natural surroundings from the deck. This high quality home is set on 5 acres of open land just 2 kilometres from Emu Bay. You will fall asleep to the undulating sounds of the ocean each night, while enjoying the serenity of a private location. This stylish home offers pristine accommodation that will not disappoint, whether you are visiting Kangaroo Island in summer or winter. The open plan living, dining, and kitchen areas flow onto 2 decks (covered and uncovered) opening the house to the stunning natural landscape. Listen for the calls of local birds or watch as kangaroos and wallabies graze in the sunset. If you wish to relax while reading a book, or unwind in front of the high definition flat screen TV...a memorable Kangaroo Island holiday awaits you at Sea Stone Cottage. Sea Stone has a bedroom with a Queen-size bed and a bedroom with a double and bunk beds. **IF SEA STONE IS NOT AVAILABLE FOR THE DATES YOU ARE INTERESTED IN, PLEASE CHECK OUT OUR OTHER PROPERTY: SEA LOFT. Emu Bay is a beautiful, long white beach. It stretches 5 kilometres with vehicle access onto the beach. It is the most popular swimming beach on the island but even in the height of summer you will usually have it all to yourself. There is a jetty for fishing. Kangaroo Island is Australia's third largest island; located 110 km (70 miles) south-west of Adelaide and easily accessible by Ferry or Plane. It is one of Australia's great scenic treasures and a must for anyone interested in travel to fascinating wilderness destinations. "Really enjoyed your lovely light filled cottage and artwork. You should open your doors for Art Feast!! Thank you!" S. G.
Emu Bay was quaint, the house was quite spacious, and although it was not far from the main road in and out, it had surprisingly little traffic noise. I did find the water pump very noisy, as it was prone to starting up randomly when we were not using any water. The wild life around the house was nice to watch as the roos casually fed on the grass around the house. The house was 2 km from Emu Bay beach which was spectacular, and about 10 mins from Kingscote, I had limited or no mobile reception (which is not a bad thing at all). KI was a great deal bigger than I expected, and all the activities we wanted to do were nearer to the ferry end of the island, so next time I would have to weigh up my options, nice accommodation and shops or close by activities. either way, it was a very pleasant stay, and would certainly go back. from bed. The house is definitely designed to allow guests to appreciate the beautiful natural world that surrounds the house, from the inside. The wood stove kept us toasty and it was a treat to return to this cosy space after a day out and about (we hiked North Cape, surfed Pennington and D'Estrees and toured the western end. I would highly recommend this cottage to anyone who prefers accommodation with heart and soul. Sea Stone Cottage is a lovely looking home in a fantastic location. We loved the beautiful views, fireplace, children’s books, exposed timber and large quiet yard. It is obvious the care and thought that went into the design of the house with the sunlight streaming in of a morning and great sunsets from the verandah. We were disappointed in the cleanliness and presentation of the cottage which detracted from our holiday experience. Simple things such as ensuring there is sufficient unchipped crockery and glassware, fire tools, oven mitts and giving the house a thorough clean would make for a better experience. Nice quiet location with lots of wild life in the mornings and beds were comfortable and over all has a nice relaxing fill.The cleanliness of property needs a good going over and small things like having fire wood ready if needed and gas in BBQ would have made the whole experience a whole lot better .